Regardless of which Operating System you use, the majority of power users are always looking for ways to gain efficiency to their day-to-day activities. Chrome OS users are no different. As one who uses a Google Pixelbook for my daily driver, any time I can find a shortcut that makes things faster for me, I leverage it as much as I can. The challenge with Chrome OS is not that these shortcuts are not there. It is that the platform is still relatively new in the grand scheme of things and they are simply not well known. Consider that Chrome OS is just shy of being 7 years old while Windows in some shape or form has been around for 33 years. Even MacOS has been around for 17 years now. The benefit of having that much time in development is all the little tricks to get to things or improve efficiency are documented. Chrome OS? Not so much. That’s the point of this article. I’m going to outline three trackpad tricks you have in Chrome OS that will hopefully make you a little bit more efficient. All three of these tips are accessed by using three fingers on the trackpad and performing an action. 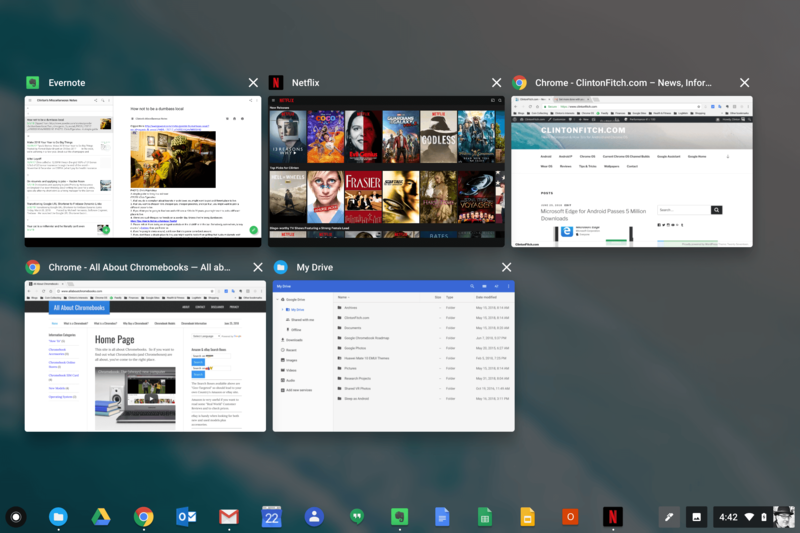 With the adoption of Android apps in Chrome OS, the need to be able to quickly see all the windows and apps you have open has become increasingly important. But if you are like me and have a bunch of apps going at the same time, finding the one you want can be a bit time consuming. To see all of the apps you have open, use three fingers on your trackpad and swipe up. This will give you a bird’s eye view of all your open apps like you see below. From there, you can click (or tap) the one you want to navigate to as you continue to work through your day. By-the-way, you can also switch between these with a keyboard shortcut too. Just press and hold the alt button then tap the tab button to bring up the mini task switcher. How much you will use this next tip depends on how you like to open links on a site. Most sites, when you click on a link, will have that site open up in the same page as the site. This is done for a lot of reasons but mostly because of SEO. For example, every link in articles on ClintonFitch.com opens in the same window. The only exception are the Pages for the site (like the Tips & Tricks page). Sometimes it is handy to have a new tap opened when you click on a link. If you want to do that, simply click it with three fingers on the trackpad. That will force Chrome to open the link in a new browser tab. Now that have used the three finger tap to open up a link in a new tab, you may find yourself with a bunch of tabs open in Chrome. 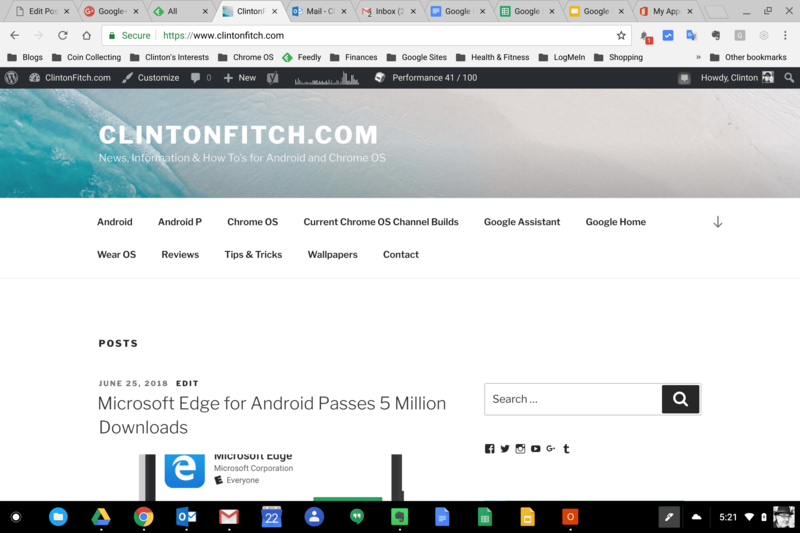 Below is a screen capture of Chrome on my Pixelbook. It is how my browser stays open the vast majority of the day and I’m pretty good about cleaning up tabs I no longer need. Fortunately for me and for you, there is a quick way to navigate between all your open tabs. Using three fingers on your trackpad, just swipe left or right. This will move you from one tab to another, allowing you to quickly move between tabs without actually have to click on anything. It’s a small thing but it can make a big difference for those of who have a bunch of tabs open. Gives these three finger actions on your trackpad a try and see what you think. Hopefully they will help you as they have helped me. For more Chrome OS tips and tricks, head over to the Tips & Tricks page.